cards & clutter: Ahoy matey! Hi everyone :) I am sharing a card that I made for the September Card Chain challenge. The challenge gives four options and you can use one or combine any multiples of them. The one that I chose was pirates. This is actually one of the first sets that I bought when I started really getting into stamping and it is still one of my favorites. I created the background by blending distress oxides and then splattering water on it. 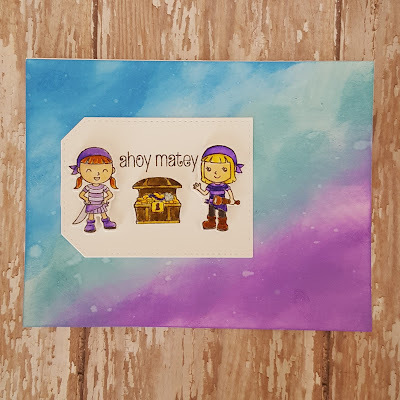 The pirates and treasure were stamped on a scrap piece of white cardstock that I colored and then cut out with the coordinating dies. I added them to a white tag and stamped the sentiment before adding to the background. I am sharing this card in Simon Says Stamp Wednesday challenge - Anything Goes. Adorable card! Such cute images!! Love your fabulous background! !